If you’re like me, you bought a Madeleine mold a few years ago when the Madeleine craze hit, but you haven’t used it in a while. 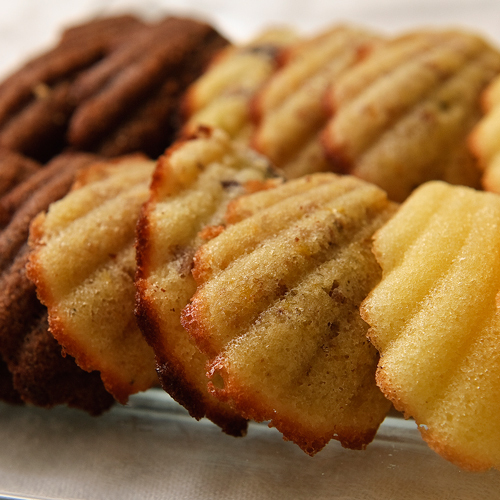 But every time you do make Madeleines, you wonder why you don’t make them more often. While there are tons of good recipes for them out there, I love this one—it brings wonderfully buttery cakes in a light-spongy package. I think they’re perfect for serving with ice cream for a casual dessert with friends. 1. Preheat the oven to 375°F. Coat two (12-cavity) madeleine molds (each cavity should be about 3 inches long, with a 2-tablespoon capacity) with baking spray. If using silicone molds, place them on baking sheets to make it easier to put them into and remove them from the oven (metal molds do not need to be placed on baking sheets). 2. In a small bowl, whisk together the flour and salt. In the bowl of an electric mixer, beat the eggs and vanilla on high speed until thick and lemon-colored, about 5 minutes. Gradually beat in the sugar until thick and shiny, about 5 minutes more. Sift the flour and salt, one third at a time, over the egg mixture, folding in after each addition just until blended. Gently stir in the cooled melted butter. 3. Spoon the batter into the madeleine molds, filling each three-quarters full. Note that you may have a tablespoon or two of extra batter left over; discard this rather than overfilling the molds. 4. Bake until the edges are golden and the tops spring back when lightly touched, 8 to 11 minutes. Let the cakes stand for 1 minute in their molds, then loosen with the tip of a knife and invert onto a wire rack to cool. Before serving, sift confectioners’ sugar over the madeleines. Citrus Madeleines. Add 1 teaspoon finely grated lemon, lime, or orange zest with the vanilla extract. Orange-Chocolate Madeleines. Add 1/4 teaspoon pure orange extract and 1 teaspoon finely grated orange zest with the vanilla extract. Decrease the flour to 1/4 cup and add 2 tablespoons sifted Dutch-processed cocoa powder to the flour mixture. Orange-Spice Madeleines. Add 1 teaspoon grated orange zest with the vanilla extract. Sift 1/4 teaspoon ground cinnamon and 1⁄8 teaspoon freshly grated nutmeg with the flour. Susan, my apologies! Some glitchy thing converted the fractions to gobbeldy-gook….I’ve fixed it now. Happy Madeleine making. And by the way, you can use either Dutch processed cocoa or regular cocoa with these (I’ve tested with both). But Dutch processes makes for a richer, more chocolately tea cake. Enjoy. And thank you for pointing out the glitch. I am doing the desserts for a ladies retreat that has a French theme. I bought a Madeleine pan to make these. My question is that I am making a variety of individual sized desserts for 160 people so I need to make ahead and freeze the variety of desserts that I am making. Can these be made a couple of weeks ahead and frozen without losing flavor?? Oh dear, Jessica. I wish I had better news. I’ve always had mixed success with freezing Madeleines. They can get a bit sticky when frozen and thawed. Some cooks might not find this objectionable. I’d say that if baked-that-day Madeleines are a “10,” then frozen and thawed Madelines are about an 8. But frozen and thawed Madeleines are better than Madeleines that have been made a couple days in advance and allowed to stand at room temperature. Those can get REALLY sticky. My advice: Make a batch and freeze them and see if you find the texture to your liking. I have made several batches of the regular and chocolate-orange variations. I got a non-stick heavy pan that the cookies just slide right out of. But they get really brown around the edges–is that from the type of pan? Also, the recipe makes only 18 at the most using this pan, so I wonder if my molds are bigger than standard. I did some baking and freezing ahead and they were OK upon thawing, though maybe they were a little too done to begin with. I used them as an addition to the dessert table for a heavy-appetizer/whiskey party we hosted. Pretty and very tasty! Is your nonstick pan a dark color? If so, that will cause the brown sides. I actually don’t mind the browned sides–a little crispiness on the edges isn’t traditional, but it can taste good! Yes, your molds might be bigger. I have three different Madeleine pans, and all three are ever-so-slightly different in size. Wow. You’ve inspired me to go back and make some madeleines….I haven’t done these for way too long. I only wish they were better in the make-ahead category….